Srinagar, Aug 10 (KNS): Hurriyat Conference (G) chairman, Syed Ali Geelani paid tributes to Sheheed-e-Azeemat Sheikh Ab Aziz on his 10th martyrdom anniversary and said that he was a veteran pro-freedom leader who had dedicated his life for the sacred cause of freedom. 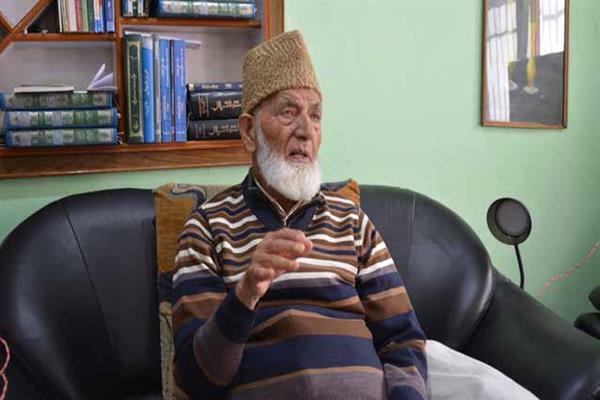 “He was often incarcerated and spent almost 20 years in different jails and interrogation centers, in and outside state,” Geelani said as per the statement issued to KNS. His sincerity towards the movement was beyond any doubt and he lived a very simple life. He achieved his cherished goal of martyrdom by donating his blood at Sheei Baramullah while he was leading his nation’s Karwani-e-Azadi,” Geelani said. He said that the best way to pay tributes to the martyrs like Shaheed-e-Azeemat is to remain loyal and steadfast towards the movement. “His valuable contributions for the ongoing movement shall be written in golden ink,” he added. Geelani paid his condolences with the bereaved family of senior leader of Tehreek-e-Hurriyat Dr. G. Mohammad Ganai on the demise of his brother Mohammad Asadullah Ganie. Hurriyat leader while remembering the deceased said that he was very sincere, straight forward and gentle in nature. He also prayed for his eternal peace and blessings of Allah for the departed soul. Meanwhile, Hurriyat Conference organized a peaceful protest march at Hyderpora chowk against the nefarious designs of India to change the demography of the state of Jammu and Kashmir. Senior Hurriyat leaders including Molvi Bashmir Irfani, Nisar Hussain Rather, Mohammad Yousuf Naqash, Bilal Ahmad Sidiqui, Hakeem Abdul Rashid, Khawaja Firdous wani, Syed Mohammad Shafi, Shakeel Ahmad Bhat, Ab. Hamid Ilahi, Haji Qudos, Syed Imtiyaz Haider, Imran Ahmad Bhat, Abdul Rashid Dar, Mohammad Hanif Dar, Mohammad Shafi Mir, Arshad Hussain Bhat and others participated in the protest march against the brazen onslaught on the state subject Law’s of Jammu and Kashmir. The leaders Molvi Bashir and Nisar Hussain rather while addressing the gathering cautioned people against the ‘ill designs of India and its supporters’ to vivisect the unity amongst the freedom loving people of Kashmir. They while elaborating the dangerous consequences of any tinkering in Article 35-A, said it is a deep conspiracy against our legitimate movement for right to self-determination, which carries multiple negative impacts in its womb to defeat the plebiscite as and when it is granted to the people of Kashmir.